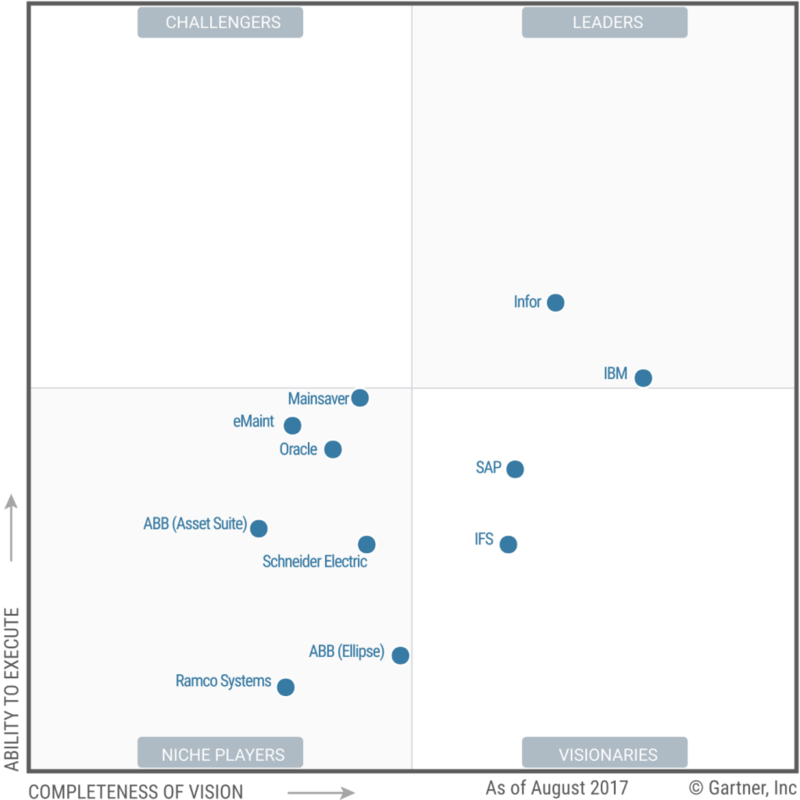 As a global provider of IBM Maximo solutions, we are thrilled to see IBM named a Leader in the latest Gartner Magic Quadrant for Enterprise Asset Management Software (released November 2017). In a market that is very mature, it is great to see Maximo consistently perform against the most prominent Enterprise Asset Management (EAM) products worldwide. Its broad range of core asset management functionality makes Maximo suitable for almost every asset-intensive industry. Plus, with both on-premises and cloud/SaaS delivery, it is scalable for large and smaller organizations. BPD Zenith has clients ranging from 6,000 user bespoke systems to 5 users fully hosted (SaaS). On its own, IBM Maximo is a leading EAM product. By extending it with these market trends, we get a solution that is hard to beat! This part of the tale is exciting for everyone who works with and supports Maximo each day. To have ‘ability to execute’ means that IBM has a mature and extensive global community of EAM support resources and partners, helping to minimize implementation risks and support shortfalls. With Maximo Implementation Services from BPD Zenith, clients have access to a team of global consultants who will work with you throughout the entire lifecycle of your project. Using our Maximo Implementation Framework, BPD guides your organization through a series of logical phases when implementing the software. Using industry-specific templates (Maximo Accelerators), we are able to streamline processes, reduce costs, and increase the quality of the project. Many end-users struggle with subsequent support issues and technical queries which is why Maximo Support is one of the most important aspects of our business. The provision of expert advice and guidance is key to our role as EAM experts. We provide quality support in conjunction with deep technical skills, customer focus and a high level of responsiveness. The result: a well-supported System equals maximum business efficiency. BPD Zenith is part of the proven ecosystem for Maximo. Having worked with Maximo for over 24 years, many of our staff have dedicated all or large parts of their careers to working with this technology. Why? Because Maximo is a true business application and it is amazing to see the different ways in which our clients leverage the platform. In fact, you can hear first-hand how Maximo runs businesses at one of the many user groups (one for every flavour you can imagine, and on a regional and national scale). With a huge peer community, user groups are always well attended, and everyone leaves having learned something new – BPD included! The latest product version, Maximo 7.6, is very deep and very modern, with lots of add-ons and partnerships.